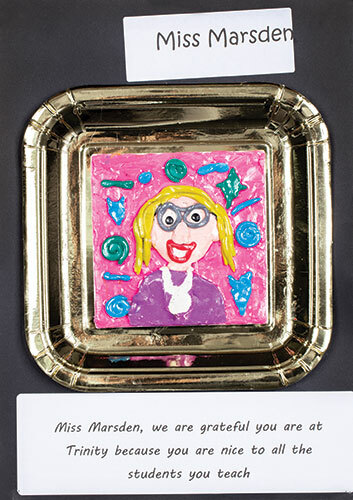 Students looked at the American author/illustrator Barbara Reid who creates illustrations using plasticine. 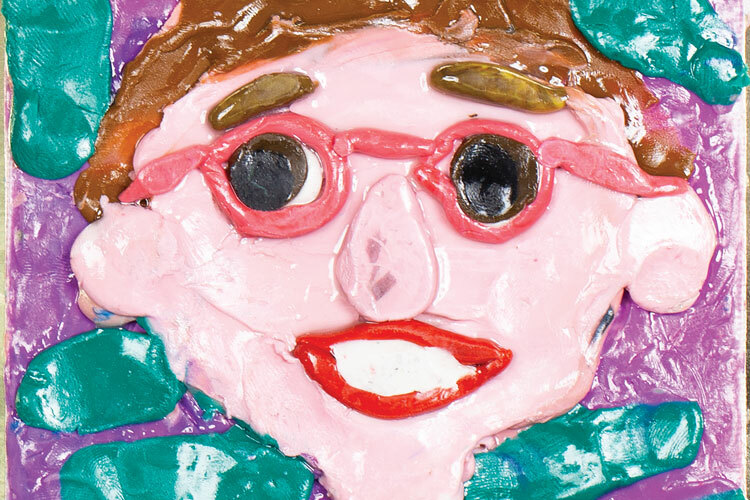 Students watched videos on how Reid layers plasticine to create dimension in her works. 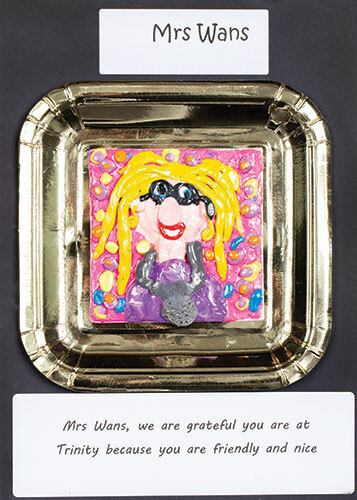 We also looked at Cassie Stephens art lesson on staff gratitude portraits. Students began by creating a background design on small canvas boards by blending a colour with their fingers to cover the board. 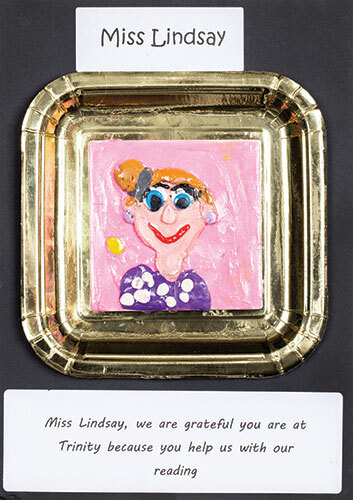 They then worked on proportions of the face to create staff portraits. They were asked to really think about the staff member and their characteristics, hair colour, eye colour etc. 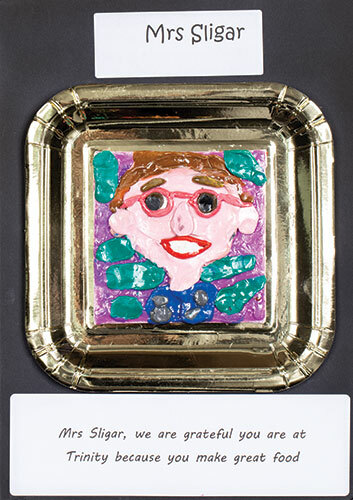 Using the two basic shapes students created a portrait using plasticine. 1. A- “PANCAKE” (Roll a small ball/sphere. Set it on the workspace and press down on it with your thumb to flatten.) “What could this be used for?” head, eyes etc. 2. A- “NOODLE” (Roll a thin worm/cylinder. Set it on the workspace and flatten slightly. What could this be used for? – hair, mouth, glasses etc. 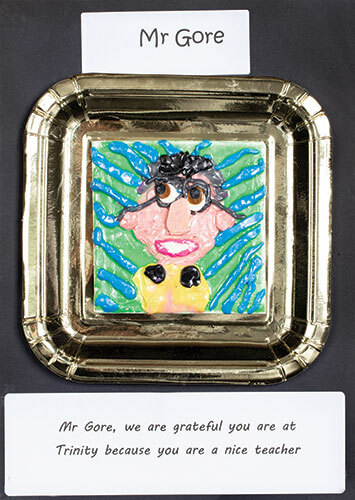 Once finished, the students were asked about the word ‘gratitude’, brainstorming ways that we can be grateful to the staff at our school. 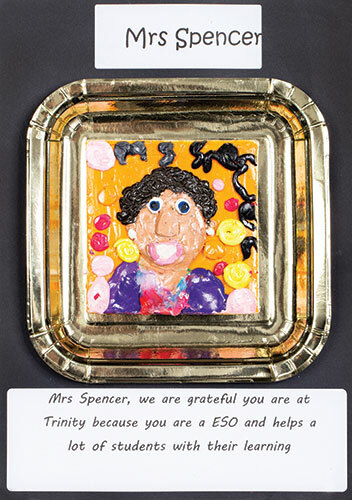 Students had to write a sentence about why they are grateful for that teacher to be part of the Trinity community.